Does your overactive bladder (OAB) get in the way of a good night’s rest, important work meetings, or your social life? When you constantly make trips to the bathroom, a productive day might seem like an impossible goal. But an overactive bladder isn’t just inconvenient — it can also be embarrassing. Your fear of an accident may hold you back from enjoying life as you should. Thankfully, OAB can be treated. Here at Advanced Urology Associates (AUA), we have a team of specialists and physicians who treat cases like yours every day. For overactive bladder services near Naperville, IL, turn to our clinic. 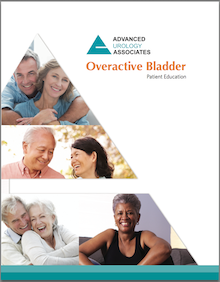 You may be surprised to learn that an overactive bladder is a very common condition. In fact, according to the Urology Care Foundation, 33 million Americans suffer from this condition. That’s about 30 to 40 percent of people in the U.S. Many of these people put off seeing a doctor about overactive bladder services out of embarrassment or because they think their condition isn’t serious enough to warrant treatment. But whether your symptoms or mild or severe, we at AUA are dedicated to finding the best treatment for you. Let us help you regain control over your life. Schedule an appointment for OAB services today. We have three convenient locations near Naperville, IL, and offer easy online scheduling. Fill out our online form or call 815.409.4930.